Home　›　For the Public　›　FAQ　›　What are iPS cells? The following answers are based on information available as of October, 2015. Induced pluripotent stem cells (iPSCs) are a new type of pluripotent stem cells first generated in 2006 in mouse. They represent a potentially important resource for applications in regenerative medicine. In this section, we will look at how iPSCs are made, why they may be important, and how they might one day make contributions in medicine. What kind of cells are iPS cells? Induced pluripotent stem cells or iPS cells) were established by introducing a small number of genes into ordinary human somatic (differentiated) cells. These pluripotent cells can differentiate into any type of cell in the body and proliferate indefinitely in culture. iPS cells were first generated by Professor Shinya Yamanaka’s group at Kyoto University. The process of changing a cell from a differentiated to a pluripotent state is called reprogramming. The method developed by the Yamanaka group has been shown to be highly reproducible, relatively simple, and is considered a major scientific breakthrough. How are iPS cells likely to be utilized? It is thought that iPS cells will be useful in elucidating the causes of disease, developing new drugs, and in cell transplantation therapy and other forms of regenerative medicine. Regenerative medicine is a therapy aimed at restoring functions lost through disease or injury. Regenerative medicine in the case of diabetes mellitus, for example, involves transplanting cells with the ability to regulate blood sugar level, or in the case of traumas where nerves have become severed, transplanting nerve cells that can help restore the interrupted connection. iPS cells could be used to make these transplanted cells. Meanwhile, by generating iPS cells from the somatic cells of patients with intractable diseases and inducing them to differentiate into the cells of the diseased tissue, we hope to enable research to elucidate the causes of the respective disease. One example is diseases which arise due to changes in the brain, as brain cells are extremely difficult to acquire and study from live patients. Using iPS cells, researchers hope to compare healthy and diseased cells. iPS cells will also make it possible to evaluate and test pharmaceutical efficacy, side effects, and toxicity in a way not possible in the human body, which should give a great impetus to new drug development. Once safety has been ensured, we can additionally look forward to applications in regenerative medicine, including cell transplantation therapy involving transplantation of tissue and organ cells created by differentiation from patient-derived iPS cells. What research led to the generation of iPS cells? Scientists have been studying the possibility of regenerative approaches to treat human medical conditions for decades. In 1981, Professor Martin Evans and colleagues at Cambridge University (UK) established the first line of mouse embryonic stem (ES) cells. ES cells are a well-known type of pluripotent cell, which can give rise to any type of cell in the body. Seventeen years later, Professor James Thomson established the first human ES cell line, which as the first physiological source of pluripotent human cells increased the interest in the potential of regenerative medicine applications. Human ES cells are problematic, however, because their derivation involves the destruction of early-stage human embryos left over from in vitro fertilization procedures, which has led to various ethical and religious debates and prompted governments in many countries to put restrictions on their creation and use, making them in some cases difficult to use even for legitimate research purposes. In addition, due to the difficulty in deriving ES cells from individual patients, human ES cell-based cell therapies would in many cases involve the use of cells generated from stem cells from another person, giving rise to the problem of rejection by the recipient's immune system. Many labs around the world were investigating alternative sources of pluripotent cells as a way to avoid these problems when Professor Shinya Yamanaka’s group first reported mouse iPS cells in 2006, followed soon thereafter by human iPS cells in 2007. How are iPS cells different from human embryonic stem cells? Human embryonic stem (ES) cells are established by removing cells from a 6-7 day old embryo and growing them in culture. In contrast, induced pluripotent stem cells can be generated using cells from an adult body, such as skin, which are plentiful and harmless to remove. As this does not require the destruction of an embryo, it avoids many of the ethical issues that surround human ES cells. Furthermore, unlike human ES cells, it is possible to derive patient-specific iPS cells and induce them into differentiated cells of various types, which can then be transplanted back into the patient without risk of immune rejection. How did Professor Shinya Yamanaka’s group first generate iPS cells? Professor Shinya Yamanaka was investigating the genes expressed in embryonic stem (ES) cells and in 2000 began searching for an alternative source of pluripotent stem cells. His group found that by introducing just a few of these genes - Oct3/4, Sox2, KLf4, and c-Myc -into mouse somatic cells (fibroblasts) by retroviral vectors and culturing the cells for a few weeks, the cells could be reprogrammed to a pluripotent state resembling that of ES cells, which can be differentiated into cells of various types in the body. His team first reported his success with mouse iPS cells in 2006 and human iPS cells in November 2007. Are there other methods for creating iPS cells? Labs around the world are working on new methods to induce pluripotency. For example, simultaneous to the report of human iPS cells by the Shinya Yamanaka group, Professor James Thomson's group in the United States reported a technique for making human iPS cells using a slightly different combination of genes - Oct3/4, Sox2, Nanog and Lin28. A number of other groups have used different viral vectors, such as lentiviruses and adenoviruses, substituted genes with chemicals, and used recombinant proteins. After the first breakthrough, CiRA researched various generation methods and have succeeded in establishing a generation method with higher levels of safety. This was achieved, for instance, by using the L-Myc gene to replace the c-Myc gene, which was thought to increase the risk of carcinogenesis, and by using episomal plasmids to successfully generate human iPS cells without the use of viral vectors, which are thought to cause cancer by damaging the original genome. Can iPS cells be made from people of any age? Yes, in Japan iPSCs have been derived from people as young as 6 and as old as 81. There is no significant difference in the pluripotency shown by these cells. When will it be possible to use iPS cells in new drug development (drug discovery) and regenerative medicine? Compared to 2006, when the generation of iPS cells was first announced, iPS cell research has made great progress. Among its achievements have been advancing research to establish standards for iPS cells, establishing methods of creating safe iPS cells, and confirming therapeutic effects and safety using laboratory animals. In 2013, clinical research to confirm safety in humans commenced. For safety and other reasons, there is no fixed date, but researchers aim to make medical applications available as soon as possible. Which tissues and organs can have their cells generated from iPS cells? According to current research findings reported from Japan and overseas, iPS cells are capable of differentiation into the constituent cells of a wide range of tissues and organs, including nerves, cardiac muscle, and blood. However, organs are more complex because of their three-dimensional (3D) structure. Small livers have been reported (Nature. 2013 July 25; 499: 481-484), but there are as yet no reports of large 3D, functional organs of human size. This is an area that requires a combination of iPS cell technologies with 3D printers, biomaterials, and other technologies. When iPS cell technology is established and medical applications have become possible, will treatment of all diseases and injuries be possible? In theory, iPS cells should be able to differentiate into any of the cell types that make up the body, but that does not necessarily mean that they will be applicable to any purpose. A relevant example may be cases of injury to the brain where the memory is stored, as the formation of memory and related questions remain a great riddle within the field of neuroscience. There may also be situations where, instead of using cells, it will be preferable to wait for the advent of new drugs and therapeutic equipment. By developing in parallel partnership with other research fields, we need to investigate which are the diseases where iPS cell technology will be capable of effective treatment. I have read in the media that iPS cells can cause immune rejection. Is that true? In May 2011, iPS cells prepared from mice were transplanted into other mice that were genetically identical. It was reported from the findings that iPS cells may be more likely to provoke immune reaction than embryonic stem (ES) cells, and this finding was covered widely across the media (Zhao et al. Nature. 2011 May 13;474(7350): 212-215). Coming at a time when there had so far been no clear analysis of what reaction might occur following transplantation of iPS cells, it was an important report. However, CiRA believed that more detailed testing was required and responded with a commentary published in a U.S. journal (Okita et al. Circulation Research 2011 Sep16;109(7):720-721.). In the study conducted by Zhao and his fellow researchers, undifferentiated iPS cells were used in the transplant, but this is in fact quite different to what would happen in actual medical application. Transplantation of undifferentiated iPS cells leads to the formation of teratomas, so when cells are used in medical practice, they are first induced to differentiate fully into the target cell type and can only be transplanted after removal of any undifferentiated cells. When tumors form within our bodies, the immune system reacts in an attempt to destroy them. Even if teratoma form by transplanting autologous iPS cells in an undifferentiated state, as in the study by Zhao et al., it is only to be expected that an immune reaction will occur to try to destroy it. In 2013, CiRA Professor Jun Takahashi and his group carried out research in which nerve cells generated from iPS cells were transplanted into monkey brains. They reported that iPS cell-derived neurons made with the animal’s own cells caused almost no immune reaction. We now need to study whether immune reaction occurs under these conditions, which reflect those of actual medical transplant practice. What issues are associated with the safety of iPS cells? Research is ongoing in Japan and overseas with the aim of realizing cell transplantation therapy using iPS cells. One safety issue of concern is the risk of tumor formation. CiRA in particular has focused its resources on this issue. Broadly speaking, there are two main theories as to the mechanism whereby iPS cells may form tumors. One theory is that iPS cells form tumors in response either to reactivation of the reprogramming factors inserted into the cell or through damage caused to the original cell genome through the artificial insertion of the reprogramming factors. In response, a search was launched for optimal reprogramming factors which do not cause reactivation, and a method of generating iPS cells was developed in which reprogramming factors are not incorporated into the cell chromosomes and damage to the host genome is therefore avoided. The other theory is that residues of undifferentiated cells - cells which have not successfully completed differentiation to the target cell type - or other factors lead to the formation of teratomas, a kind of benign tumor. This theory requires research on iPS cell proliferation and differentiation. When Professor Shinya Yamanaka and his research team announced the successful generation of mouse iPS cells, one of the reprogramming factors they used was c-Myc, which is known to be an oncogene, that is a cancer-causing gene. There have been suggestions that this gene may be activated within the cell and cause a tumor to form. However, in 2010, CiRA Lecturer Masato Nakagawa and his team reported that L-Myc was a promising replacement factor for c-Myc. iPS cells created using L-Myc not only display almost no tumor formation, they also have a high rate of successful generation and a high degree of pluripotency. When the reprogramming factors required to generate iPS cells were inserted into the cells of the skin or other body tissues, early methods employed a retrovirus or lentivirus as a "vector," or carrier. In these methods, the target genes are inserted into the viruses with the which the cells were then infected in order to deliver the target genes. When a retrovirus or lentivirus is used as a vector, however, the viruses are incorporated into the cells’ genomic DNA in a random fashion. This may cause some of the cells’ original genes to be lost, or in other cases activated, resulting in a risk of cancerous changes. In 2008, to remedy this risk, CiRA Lecturer Keisuke Okita and his team explored the use of a circular DNA fragment known as a plasmid, which is not incorporated into the cell chromosome, as a substitute to the retrovirus or lentivirus methods. In this way, they developed a method of generating iPS cells in which the reprogramming factors are not incorporated into the cell chromosome. In 2011, Okita and his team further improved the efficiency generation by introducing into a self-replicating episomal plasmid six factors - OCT3/4, SOX2, KLF4, LIN28, L-MYC, and p53shRNA. Once iPS cells have been induced to differentiate into the target somatic cells using the appropriate genes and gene insertion methods as explained above, the differentiated cells can be relied upon not to revert to the undifferentiated state. However, there may sometimes be a residue of undifferentiated cells which have not completed the process of differentiation into the target cells, and it is possible that these cells, however few, may form a tumor. Scientists had already established that different iPS cell lines, even if generated from the same individual using the same method, might nevertheless display differences in proliferation and differentiation potentials. This meant that, if iPS cells with low differentiation potential were used, there was a risk that a residue of cells in the cell group might fail to fully differentiate and result in the formation of a teratoma. In 2013, a team led by CiRA Lecturer Kazutoshi Takahashi and Dr. Michiyo Aoi, now an assistant professor at Kobe University, developed a simple method to screen for iPS cell lines that have high potential to differentiate into nerve cells. There is also a risk of tumorigenesis from genomic or other damage arising at the iPS cell generation stage or at the subsequent culture stage. CiRA Assistant Professor Akira Watanabe and his team have developed a sensitive method to detect genomic and other damage in iPS cells using the latest equipment. In cell transplantation therapy, iPS cells are not transplanted directly into the human body. Instead, cells are transplanted after first being differentiated into the target cell type. It is therefore important to develop a reliable method of inducing iPS cells to differentiate into the target cell type. CiRA is currently working to develop technology for differentiation into a range of different cell types from iPS cells. CiRA Professor Jun Takahashi and his team have developed a highly efficient method of inducing iPS cells to differentiate into dopamine-producing nerve cells. In 2014, CiRA Professor Koji Eto and his team reported a method of producing platelets from iPS cells that is both reliable and can yield high volumes. These findings represent a major step toward iPS cell-based regenerative medicine for nerve diseases such as Parkinson’s disease and blood diseases such as aplastic anemia. By when will safety issues be overcome? Since the generation of iPS cells was first reported in 2006, research has led to great progress in generation methods, while quality assessment methods are also being put in place. In 2014, iPS cell-derived retinal pigment epithelial cells were transplanted into a patient with age-related macular degeneration (AMD), a significant milestone in the use of iPS cell technology for clinical application. Additionally, in the case of spinal cord injury, Parkinson’s disease (news release 2014.03.07, news release 2013.09.27, news release 2012.01.27), heart failure, and blood diseases including aplastic anemia, the safety of iPS cell-based regenerative medicine has been examined in animal experiments with hope that it will be used in patients in the upcoming years. iPS cells generated from patient cells can be used to create cells that replicate the tissue affected by disease. This technique offers the prospect of using iPS cells to test drug efficacy, side effects, and toxicity and to develop new drugs and therapies. Which issues need to be resolved in order to realize this goal? Compared to when animal cells or other materials are used, research using cells generated from patient-derived iPS cells is likely to produce models that more accurately reflect the mechanisms of human disease. In other words, it should allow us to better answers to the question of why disease develops, and as a result it should be more useful in the search for drugs that can halt or delay the progression of the disease or cure it. 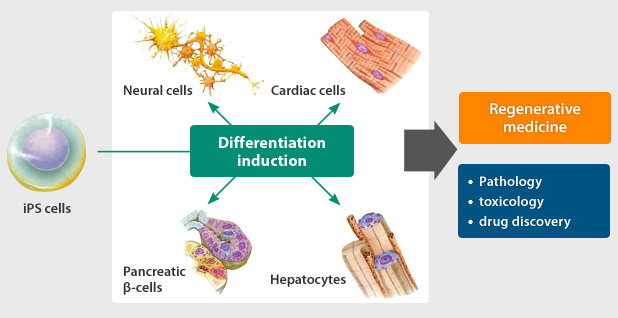 Moreover, by generating iPS cells from a range of different genetic backgrounds, inducing them to differentiate into the cells of the heart, liver, or other organs susceptible to drug side effects, and then exposing these cells to the chemical compounds on which drugs are based, it will be possible to investigate whether these compounds interfere with basic organ function or have other side effects. This kind of research will not only promote cell transplantation, but will also make therapies available to a greater number of patients. We therefore look forward to seeing such research promoted strongly going forward. However, whether abnormalities observed at the cellular level using iPS cell technology are the true cause of the patient’s actual disease needs to be carefully studied. Broad-based research is also needed to examine the effectiveness of drugs discovered using iPS cell techniques and whether these drugs are sufficiently safe. Can I visit and take a tour of CiRA facilities? CiRA holds a monthly tour of CiRA facilities for the general public to provide an opportunity to know more about CiRA. Please read the guideline of the application procedure and contact us. I would like to participate in research at CiRA. Are any positions available? We provide up-to-date information on open positions on this website. Please check the CiRA Jobs page. What intellectual property concerning iPS cells does Kyoto University hold? Kyoto University holds basic patents associated with iPS cell technology in Japan and in other countries and regions including Europe and the United States. For details, see the CiRA IP page. How long is the term of the basic patents? The term of the patents is basically 20 years from the date of filing. Is the coverage of overseas patents the same as that of the Japanese patents? They are almost the same. However, they are slightly different because each patent has been issued in different countries with its own examination system. Which country has CiRA filed for patents in? We have filed for patents in countries and regions including Australia, Brazil, Canada, China, Egypt, Europe, India, Korea, Mexico, New Zealand, the United States. Which countries in Europe has CiRA claimed for patents in? Of the 31 member countries of the European Patent Convention, 17 countries such as France, Germany, and the United Kindom have been selected by Kyoto University. What is the scope of the patent rights obtained in Europe and the United States? Kyoto University has obtained one fundamental patent in Europe and four fundamental patents in the United States. For details, see the CiRA IP page. How does Kyoto University manage its iPSC intellectual property? The CiRA works in cooperation with the Kyoto University Office of Society-Academia Collaboration for Innovation, and iPS Academia Japan Inc. manages patents and licenses their usage. What strategy has Kyoto University established for obtaining iPS cell-related patents? Kyoto University has adopted a patent strategy centered on CiRA, which is designed to make sure that the maximum number of people can benefit from the findings of iPS cell research. In order to obtain patents rights that are important for medical applications, in addition to fundamental patents on iPS cell generation methods, we aim to obtain patents relating to peripheral technologies such as cell quality evaluation methods, differentiation induction methods, cell processing methods, and drug screening. We will consider the granting of licenses to those enterprises able to make optimal use of patent technologies in the respective categories. How can I apply to get a license to use the Kyoto University patent? iPS Academia Japan manages patents on iPS cell generation and licenses for medical development and commercialization. Please contact iPS Academia Japan Inc. for details. Do any other organizations hold patents relating to iPS cells? Several other organizations have filed patent applications on iPS cell technologies, but none of them have been granted yet in Japan. However, some companies and research institutes overseas have obtained patents based on their iPS cell technologies. What effect will the Kyoto University patents have on researchers in other institutions? The acquisition of the patents by Kyoto University prevents any company from obtaining exclusive license to iPS cell technology and will ensure that iPS cells are widely available at reasonable and appropriate licensing fees. In the event that patents on iPS cells are obtained by overseas companies or research institutions, will healthcare costs associated with the use of iPS cell technologies rise in Japan? It is possible that an exclusive right to an iPS cell technology would cause associate healthcare costs to rise. Government policies need to be developed in order to ensure reasonable and appropriate pricing of iPS cell-related therapies should they become available. Where can I get more information about Kyoto University's intellectual property? Are there any guidelines on the generation of germ line cells from pluripotent stem cells? Scientists have shown in experiments using ES and iPS cells from various animal species that it is possible to induce the differentiation of germ line cells such as sperm, which are capable of fertilization and contributing to viable offspring. It may therefore be possible to extend these techniques to use in human cells. In Japan, however, research relating to the generation of human germ line cells from ES cells was prohibited for ethical reasons by the Ministry of Education, Culture, Sports, Science and Technology (MEXT) in guidelines published in 2001. Subsequent advance in animal research and the study of germ line cell differentiation, coupled with considerations for the potential of such technologies to help infertile individuals led to the amendment of the original MEXT guidelines (1), and the issue of new policies (2) which were put into effect in May 2010. Under these revised regulations, it is now possible for researchers to use human ESCs, iPSCs or tissue (somatic) stem cells in research aimed at differentiation into the germ lineage that meets certain conditions, such as consent from the cell donors and the requirement that the derived cells not be used for fertilization. (2) MEXT "The Guideline for the research to generate germ cells from human iPS cells and human tissue stem cells"
What is the objective of research to create germ cells from ES cells and iPS cells? The objective of research to create germ cells from human ES cells and iPS cells is to elucidate the mechanism of germ cell formation and additionally to contribute using these cells to drug development and previously impossible fertility treatments. Current regulation does not permit research whose objective is to facilitate conception and birth of offspring using artificially created human germ cells. However, human ES cells and iPS cells could prove to be excellent tools for the study of germ cell formation and treatment against infertility. Germ cells are an especially controversial topic that requires meticulous policy that can gain the public’s consensus. Does CiRA conduct research into the generation of germ line cells from iPS cells? The Ministry of Education, Culture, Sports, Science and Technology (MEXT) guidelines were revised in May 2010 to allow for germ line cell experiments under specific conditions. To receive permission for this sort of research, a detailed research plan must be submitted to the institute’s ethical review board and approved by MEXT. Accordingly, a researcher at the Department of Life Science Frontiers had a research plan accepted on April 8, 2011, by MEXT, which has allowed CiRA to conduct research on the generation of germ line cells from iPS/ES cells.